This is the 15th anniversary of Victory Motorcycles, and Victory has unveiled in New York a 15th Anniversary Cross Country Tour Limited Edition model to kick off its celebration. Production will be limited to 150 units, each featuring a Sunset Red over Gloss Black paint with gold pin-striping, inspired by the first Victory built 15 years ago, the V92C classic cruiser. Exclusive Sunset Red over Gloss Black paint with gold pinstriping – inspired by the first Victory ever built. 15th Anniversary Fairing Badge, Saddlebag Graphics and Numbered Dash Badge. Red-letter Cam Badge and Primary Badge. Cut & Sew Seats with a custom-stitched 15th Anniversary Badge. Numerous chrome features, including: Front and Rear Fender Trim, Fuel Cap, Sprocket Cover, Engine Covers, Switch Cubes and Controls, Saddlebag Lid Rails, and Trunk Luggage Rack. Removable Saddlebag and Trunk Liners. The most storage spaceof any motorcycle in the world. 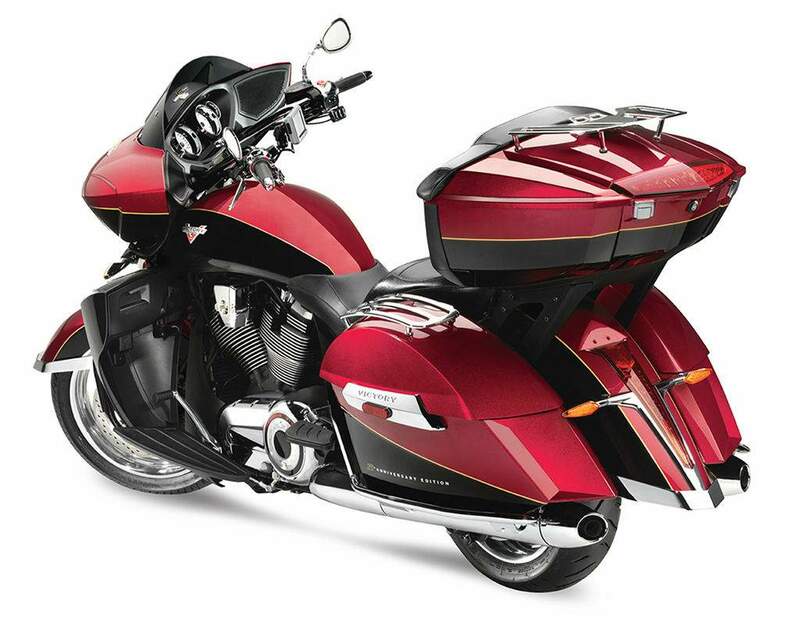 The trunk, saddlebags and two front storage compartments provide a total of 41.1 gallons of space. 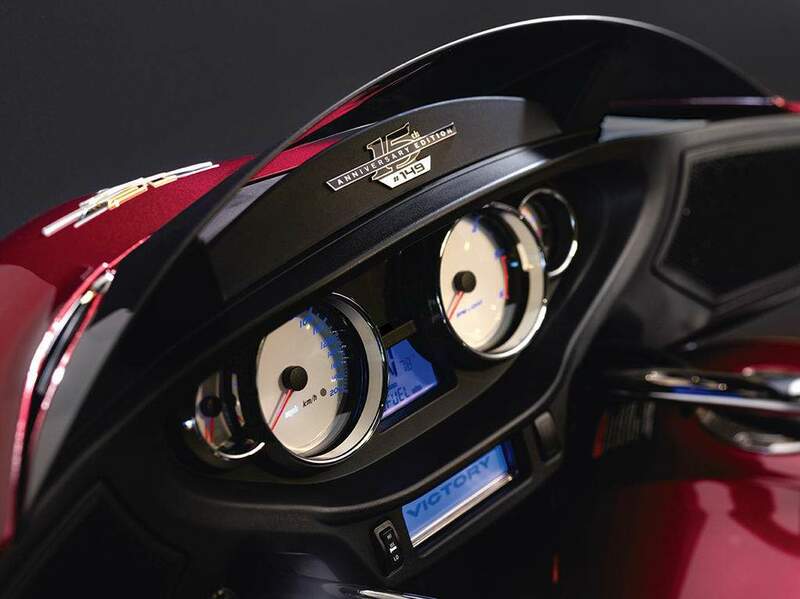 The Victory Comfort Control Systemlets riders control airflow from the front end using the adjustable Upper Air Controls and Lower Air Controls. An Audio Systemintegrated in the fairing. 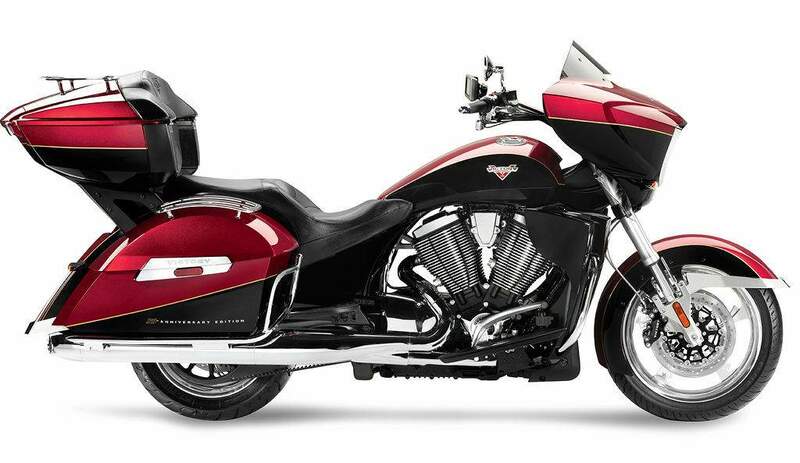 The Victory Freedom® 106/6 V-Twin,a 106-cu. in. engine that delivers 106 ft-lb of torque, mated to a 6-speed transmission with overdrive. Victory Anti-Lock Braking(ABS) that provides reliable braking to help a rider stop quickly and under control. Cruise Controlenhances comfort with its reliable performance and easy operation. The 5.8-gallon (22 liter) fuel tankprovides riders with outstanding range. Heated Seats and Heated Handgripslet riders extend their riding seasons in comfort. The Tall Windshieldprovides excellent protection and reliable visibility in all conditions. The 26.25″ Seat Heightputs a rider comfortably and confidently in control. Adjustable Passenger Floorboards let a passenger customize the comfort and ergonomics.